Thanks to my wife, Sarah, who wrote up this great review for the Glide Bikes Ezee Glider that we got to review online. When we lived in Ashland, OR, balance bikes were the norm. Rather than seeing kids tooling around playgrounds on tricycles or bikes with training wheels, you’d see little kids scooting themselves along on balance bikes. I had never seen or heard of balance bikes before and they piqued my interest as Caleb began to show signs of one day becoming mobile. On the recommendation of a blog I like, we bought Caleb a Pewi Ybike, which is a cross between a push toy that helps kids learning to walk and a pre-balance bike. With three wheels and a handle, Caleb was able to both learn to walk while holding onto it and sort-of learn to ride by sitting on it and pushing himself along. It was great for learning to walk when Caleb was 1 and for learning to ride the summer Caleb was 1.5, but this summer we realized it was way too small for Caleb to be able to use it as a bike again. So I began to research balance bikes. 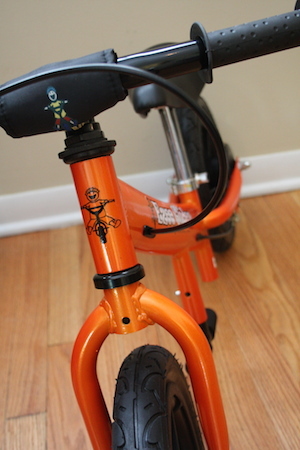 Although I was already sold on wanting one for Caleb, this site helped me learn more about balance bikes (so I could explain them to Adam and our parents) and begin to compare different models. Money was a big factor for us since our budget is very tight, and after doing some research, I decided the other key factors were: warranty, size (I wanted something that Caleb could ride now and next summer, and ideally until he is ready for a bike without training wheels), sealed ball bearings (keeps dirt from getting into the wheels so they continue to spin smoothly instead of slowing down over time), and air tires (foam tires seem great if you want to be able to use the bike indoors, but air tires provide more traction for riding outdoors). Factors I didn’t care too much about were footrests, brakes, and turn limiters (I didn’t care if the bike had those features or not), the weight of the bike or the status of the bolts (recessed bolts mean less chance of scrapes when your kid falls off). Ideally I wanted to spend under $100, but I quickly realized this was unlikely to happen as the majority of bikes that fit all of my qualifications were closer to $130-$150. So I made a list of my top picks and started watching for sales. When Glide Bikes offered to send us an Ezee Glider in exchange for an honest review, I jumped at the chance. It was at the top of my list and was probably the bike we would have ended up buying anyway. My only hesitation about buying had been its size range (12”-18”), which wasn’t quite as big as I was hoping for (Glide Bikes has a number of different models and the Ezee Glider is designed for younger kids, like Caleb), and has unsealed ball bearings (though with a lifetime warranty I kind of figured it balanced out). Like most bikes that are shipped, the Ezee Glider required some assembly, but it was minimal and Adam managed it with relative ease, putting it together one afternoon while Caleb was napping. The learning curve was a little steeper than I anticipated, and the first few times Caleb rode the bike I worried he was never going to get the hang of it, but it only took about a week and three or four short rides for him to figure it out. He hasn’t yet learned to glide or balance, so we haven’t turned the foot pegs so he can use them yet (parent tip: best not to show your child how the foot pegs will eventually work until they are actually ready to use them; Adam made that mistake and Caleb spent an afternoon crying because we wouldn’t simply push him on the bike so he could ride with his feet on the pegs), and he has no clue what the brake is, but otherwise he’s using the bike to its full advantage. It’s light weight. This wasn’t a factor that I thought was important, but it has turned out to be a big plus because it means I can easily carry it when Caleb decides he doesn’t want to ride it anymore. We went on a ride around the block one day after he first got it and halfway around the block he decided he’d rather walk, so I was left carrying/holding the bike, his helmet and the dog on her leash in one hand and holding Caleb’s hand with my other hand. While it’s not something I want to do every day, it was doable and we made it back to the house without incident. It’s easy to adjust the seat to accommodate growth (and it feels like we make small adjustments every time Caleb gets on it). I don’t see any major cons with the bike. At first we had some trouble with the seat—it would slowly get lower as he was riding and it would twist every time the bike fell, but then we realized that we’re morons bike newbies and we could easily fix the problem by tightening the nut on the seat adjuster to make the fit tighter. Now the seat stays put even when the bike crashes. The other con I discovered has to do with balance bikes in general: they don’t teach Caleb to pedal. This is fairly obvious, but I didn’t think through the fact that at daycare he would have access to tricycles but not have any experience pedaling. He seems to have figured it out on his own, but I think it kept him from using the bikes at daycare for awhile. 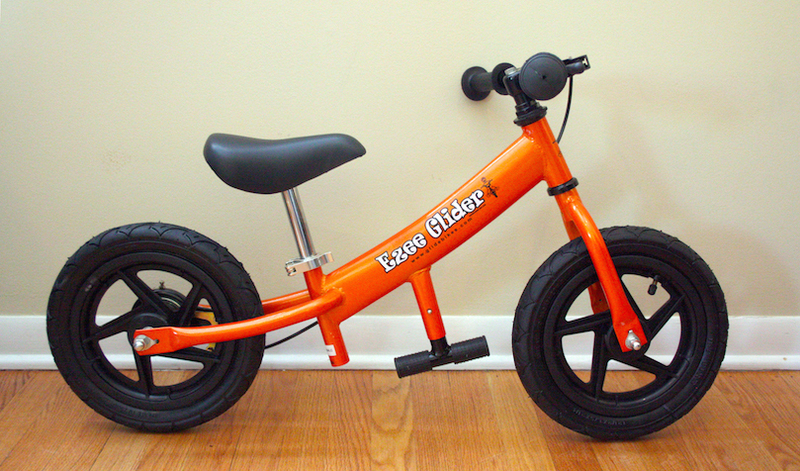 All in all, if you’re interested in trying a balance bike for your kid and want a good one that is reasonably priced, the Ezee Glider from Glide Bikes is a great bike and I would recommend it without hesitation. If money is no object for you, I would also consider the FirstBIKE (the composite frame is pretty impressive and the safety features and ski attachment are worth noting as well), the Early Rider (the only wood bike worth considering, in my opinion—the wood is marine grade so you don’t have to worry about it warping over time), and the Ridgeback Scoot (goes up to 20” so it would fit a bigger kid for longer than the Ezee Glider), but even if money is no object, I still think the Ezee Glider is a great choice that you won’t regret. Looks like a great way to get a free vasectomy. Ouch!